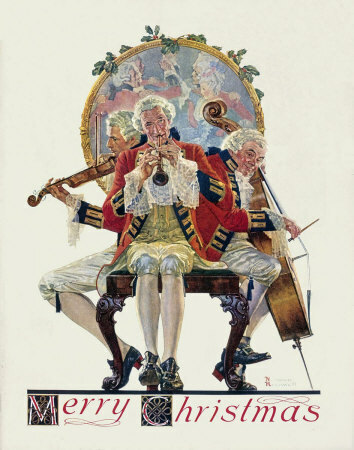 Merry Christmas: Concert Trio, this Norman Rockwell painting, appeared on the cover of The Saturday Evening Post published December 12, 1931. The original oil on canvas painting, 40.5 x 30 inches or 103 x 76 cm, is located in a private collection. This painting was Rockwell's 139th of 322 total overall pictures featured on the cover of The Post. Rockwell's career with the Post spanned 47 years, from his first cover illustration, Boy With Baby Carriage in 1916 to his last, Portrait of John F. Kennedy, in 1963. This was also the eighth Rockwell cover in 1931. The Post featured a Rockwell illustration on its cover eight times in 1931.
on page 122 of Norman Rockwell, A Definitive Catalogue by Laurie Norton Moffatt. The original cover price was still just five cents. Holly sprigs around the mirror confirm that this is a Christmas painting. Rockwell's fondness for Dickens era characterizations is revealed in this painting. Norman Rockwell had been a Charles Dickens enthusiast since he was a boy listening to his father read Dickens stories to the family for entertainment. Rockwell often sketched the characters as his father read the stories. The three main charactes in this illustration are the musicians, but almost as interesting are the people painted in the mirror behind the concert trio. Three couples are depicted dancing in the traditional style. We do not know if these six are the only ones at the Christmas party, if they are the only ones dancing, or if they are just the only ones shown in the mirror. Whatever the circumstance, they are all having a good time. The band themselves are a study in contrasts. The cello player is obviously responsible for the bands rhythm. He is stamping his foot, keeping time. He also appears to be enjoying the dancers as well. Having a good time also is the whistle player. He is also watching the dancers and is patting his foot in rhythm with the dancers. He is smiling as much as is possible while still making music. Merry Christmas: Concert Trio was only one of 322 Norman Rockwell Saturday Evening Post covers; Here is the list of Norman Rockwell Saturday Evening Post cover illustrations. On the left is the third member of the concert trio. The fiddle player almost seems oblivious to the dancers. He is not smiling. He is not tapping his feet. We do not know why the violinist is only playing the music. But if Norman Rockwell had painted him all by himself, we would not even know that a party is happening all around him. He looks younger than the other two musicians. Perhaps he has just not gotten comfortable yet. Except for the epaulets on the shoulders of the dancing men, the uniform of the band and the dancers appears to be the same. Perhaps it is a military party.